Large dealers compete to outdo one another when it comes to showcasing their products by optimizing the buyer experience and servicing customers. 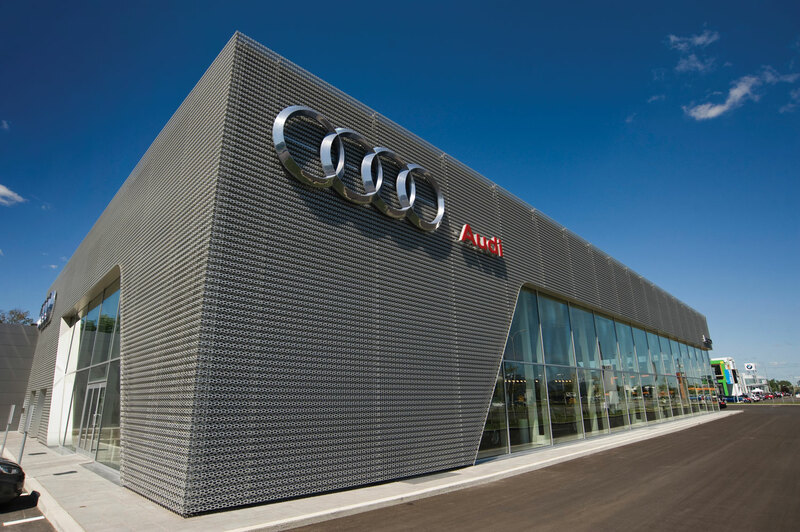 These two elements reach new levels at the new Audi Lauzon terminal in Laval. But make no mistake, it’s service that counts, as witnessed by the informed and helpful personal and professional service in evidence on every visit to Lauzon. But first, the technical details of the location which are nonetheless impressive. Facilities spread over more than 130,000 square feet on three floors, include a showroom that can hold more than 20 vehicles, an indoor service reception area that can accommodate over ten customer vehicles, a 170 seat parking garage, an automated car wash, a mechanical department with 33 service bays, and more! For added customer convenience, the facilities even include a cafe, a VIP lounge, exercise room, and business center. Wow! 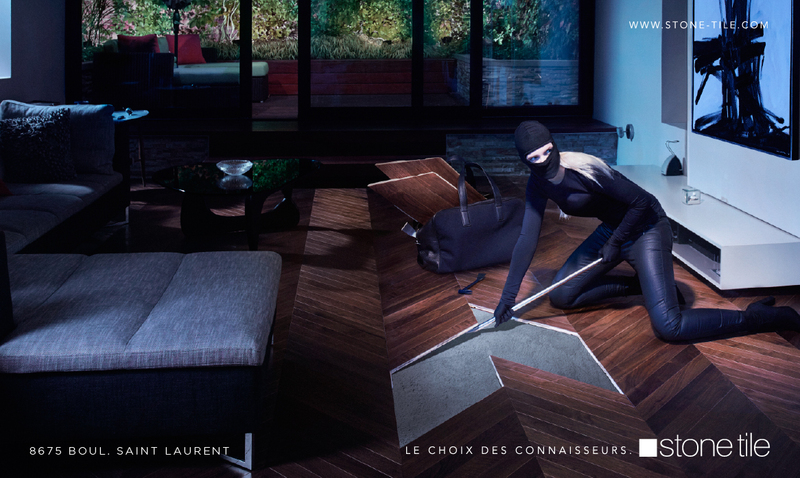 All presented in a very conceptual fashion, the central idea is to distinguish Audi from the competition. I could not help but think of the now famous Apple stores. Both use building materials and design features found in their flagship products. For example, Apple uses aluminium and glass, and at Audi and Lauzon, engineering and innovation have focused on sheets of cells resembling honeycombs that form the facade of the terminal, and which resemble the grille of the 2013 Audi RS5, soon to be seen in showrooms. And the wide use of glass recalls to mind the ‘windshield’ – a transparency that invites the eye to admire from the outside while seeing through to the showroom interiors. I could expand on the parallels between the architecture of Audi and the mind set of its dealers, but that’s not even what impresses the most. So follow me to customer service. 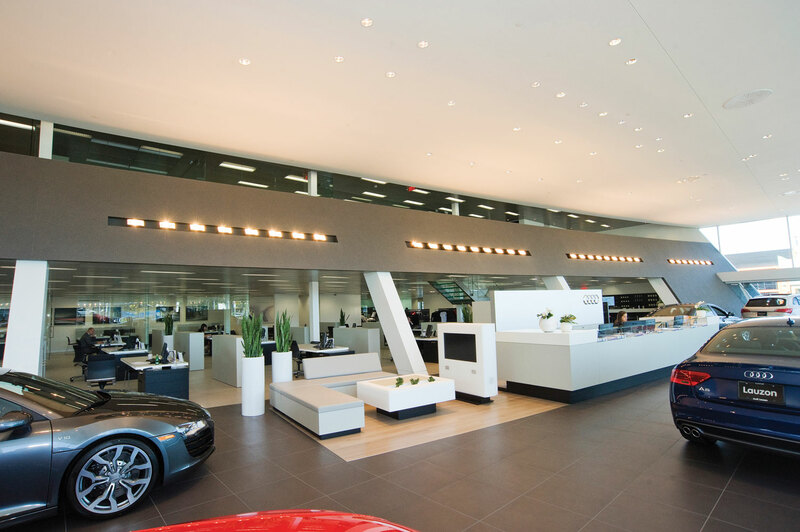 Outside, inside, on whatever floor you find yourself, the visitor is in constant visual contact with the stars of the showroom – Audi vehicles! – but is also greeted at every turn by welcoming customer service representatives who make you the center of attention. Nothing trumps sincere and helpful personal contact to inspire confidence. Add to all this the Audi reputation for quality, and a service environment that mirrors this quality, and there’s a good chance that you’ll emerge from this affable beehive of activity as the owner of a new little German sports model … or at least wish you could!